And this area has much to offer. 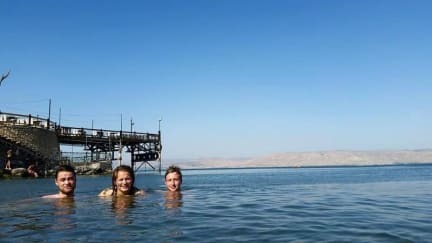 Just jump on a bus, bike, hitchhike or your rental car and soon you're in Capernaum, The Golan Heights, Galilee, Nazareth or Jordan Valley. 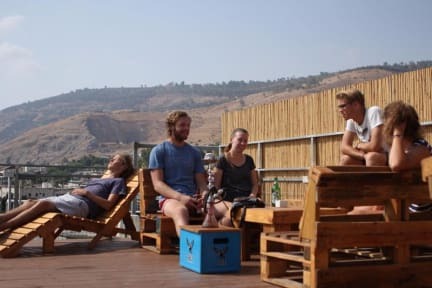 We are constantly working to make Tiberias Hostel the best base for you to return to after a day of hiking, site seeing or just enjoying the beach and nature. * Tiberias Hostel custom city & regional maps. We'll do our best to provide all the information you need to make the best out of your trip. * Free coffee and tea 24/7. * Optional breakfast for added fee (20 NIS). * Bike rental available nearby. * Big kitchen and dinning room. Great vibe, enthusiastic volunteers and staff made for a warm and welcome stay. Comfortable, plenty of common rooms and nice rooftop. Excellent experience. Very helpful and kind staff. They run a hostel that is good for interacting with other travellers. A nice place to go back to in the evening. The best you can get for the amount of money. But do not forget, it is a hostel, not a hotel. We had a very good experience except for the breakfast that we paid for. It wasn't all that was promised. Good location in the city centre of Tiberias. The kitchen is big and very well equipped. There is a roof terrace with a nice view. The dorms are a bit old-fashioned, unfortunately (old & unstable bunk beds, shortage of plugs). Sheets not really clean. Bathrooms are functional. On the up side, the hostel organises really fun bar events in a nearby Kibbutz. The location was really different to find and parking was a huge pain. Otherwise the facilities were clean and there was lots of hot water (which other hostels can say). It’s close to the beach and downtown.